The office environment is not the only place where you’ll have to be on your toes when it comes to making good impressions with superiors and coworkers. Restaurants have long been a popular place to conduct business ventures and recruitment. At some point, it is very likely you will find yourself invited to eat out, and it is probably going to be a high-stakes moment for your career. With your every move potentially being scrutinized, it can be a pressuring situation. Fortunately, it is also a fantastic opportunity for you to make a lasting impression on whoever might be there that night. To prepare yourself for success, it is imperative you are equipped with a basic knowledge of proper dining etiquette. Below are guidelines of how you should conduct yourself during certain stages of the night. Always make an effort to arrive at the selected restaurant at least 10 minutes before the time of the reservation. If you are going to be late for whatever reason, do not wait until the last minute to notify others in attendance. This also goes for potentially having to cancel the dinner altogether; 24 hours or more in advance is an appropriate buffer for cancellation. When you initially meet the other guests, greet everyone with a handshake and a smile. 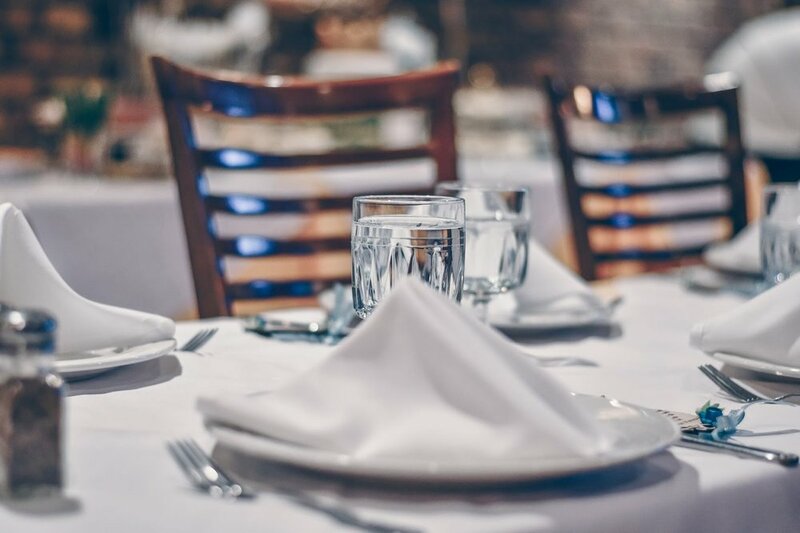 Additionally, if it is your responsibility to choose a restaurant, pick somewhere that best suits the occasion, and choose a time when the ambiance will be inviting. Ergo, don’t decide to go when you might be the only group in the restaurant. When first getting to your table, choose a seat that will not prompt others to have to squeeze around you to reach their own. There is no need to rush, wait until everyone else has found a place to assume your own. Sometimes, it can be appropriate to pull out the seats of the other guests but this can become tedious and unnecessary if there are many people. Once you are seated, assume and maintain a position with good posture. Avoid leaning too far forward or tipping your chair back, and of course, no elbows on the table! Always have your napkin laid out on your lap while seated and leave it folded on the table if you need to get up. Most likely complementary bread will be placed on your table upon arrival. Whatever you do, don’t attack the basket. Take a piece and pass around the rest to ensure everyone at the table is served. Eat the bread by breaking small portions with your hands. It is also common that your table will have some kind of alcohol, whether that is beer or wine. It’s always acceptable to politely refuse if you do not want to partake. If you do decide to drink, remain aware of how much you are consuming. Even if your guests are proceeding to have a substantial amount, limiting your own intake is probably a good idea to avoid prompting any behavior that could be embarrassing or unprofessional. When the time comes to order, try to have a general understanding of what the rest of the table is planning to get. This will help you to know if ordering appetizers or a particular entree is appropriate. The last thing you want is to have significantly more or less food than everything else. Additionally, make sure you wait your turn to talk with the waiter or let everyone else order before you do so. When your dish arrives, wait until everyone at the table has been served until you start. From the beginning, pay close attention to the pace of the table to gauge how fast you should be eating; you do not want to finish long before or after everyone else. Remember, the main focus of the night is interaction with others, so your food should just serve as a way to complement and break up the conversation. When finishing your dish, you do not have to consume every crumb on your plate but it is respectful to have eaten most of what you received. Also, try not to be picky and leave something completely untouched, at least eat a little bit of everything that was provided. Let the ‘conversation’ decide when is the right time to get the bill. Just because all the food is finished does not imply all discussion must end immediately. Hopefully, your waiter will wait until you signal him/her over and not pressure you to move along with payment. When it comes to who will actually be picking up the check, this is something you should establish long before it reaches the table. Depending on the size of your party, the right move is not always to pay yourself or let your bosses handle it, so it should certainly be something you discuss before arrival or early in the night. Additionally, providing a 10 - 20% tip is suitable for almost all restaurants. If you are fortunate to find yourself as the master of dinner etiquette among the group, don’t comment on or correct the behavior of others. Also, keep in mind the dinners are usually quite formal and getting comfortable does not imply you should treat the situation like a casual outing with friends. And lastly, at the end of the day, don’t stress about if you were perfect the entire time. Just following the basics with a patient, polite attitude can be all you need to leave the right impression. Hopefully now you feel ready to seize the night when the time comes! Good luck!